Trampoline Enclosure (Net) - Trampoline for Me! My kids are very lively, so when they jump, they jump high and far. My main concern was making trampoline as safe as possible, especially while they were small so that I can let them jump and not be worried about their every move. Parents have already a lot to think about and they don’t need a toy for their kids that will make them worry even more about kids injuring themselves or others. Minimize the risk – safety is a necessity! 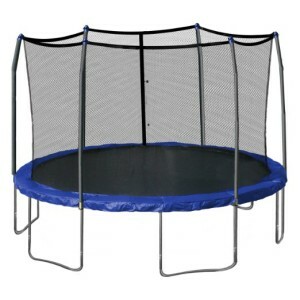 Chances are, you might have already bought the trampoline without enclosure (net). That’s great. But if you didn’t, or you bought a plain old trampoline without anything extra, you’ll probably want to make it as safe as possible, you should think about investing in this accessory. On the other hand, you might want to be informed about everything there is when it comes to safety and trampolines and that is why you came to this page. Whatever the case is, there is a lot of information that this page will provide concerning best enclosures (nets), best trampolines with enclosures (nets) along with the reviews of those products. We will talk about choosing the right enclosure, setting it up properly and making sure it stands that way, along with the buying guide for trampolines with enclosures (nets) already attached to them. There are a couple of things to say here. First of all, usually all of the manufacturers offer good instructions about assembling the whole thing, and that is the case with the safety net as well. Second, if they don’t, there is quite a good chance that your manufacturer has its own youtube channel that offers in-depth instructions, so try searching for it. I’ll give you some general rules for assembly below, so you can choose to follow that if you want to as well. That’s all. 6 simple steps. I think anybody can do this, and it isn’t really a hard thing. This is a tricky question: which is the best enclosure on the market? Unfortunately, there is no answer to this, as you can’t look at it that isolated. There is no best enclosure. There is, however, the best enclosure for your trampoline. Usually, it’s the manufacturer’s one, which you’ll find under the same name as the trampoline you bought. If you broke your enclosure, you might want to contact the customer service first, as they will maybe be able to replace it free of charge. It’s usually worth the shot, so try it. Anyways, if you want to buy the right one, just search for it on Amazon in this form: your manufacturer + size + enclosure. For example, “Skywalker 15ft round enclosure”. That should usually do the trick. If you want me to help you with anything else, feel free to contact me! Good luck with your safety measures and congratulations on taking the time to think about them!